Elected Columbia College’s tenth president was Yale educated physicist and Episcopalian minister, Frederick A.P. Barnard. After teaching at the University of Alabama and serving as Chancellor at the University of Mississippi, Barnard made his way north after the secession, despite offers of a position in the Confederate government. After serving as head of the Map and Chart Department of the U.S. Coastal Survey in Washington, D.C., he assumed the presidency of Columbia in 1864. 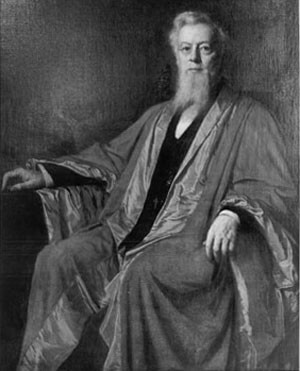 As president of Columbia College, Barnard successfully oversaw further steps in the transformation of the College into a university; including the founding of the Faculty of Political Science (1880), later a part of the Graduate School of Arts and Sciences; the School of Architecture (1881); the Industrial Education Association (1886), later Teachers College; and the School of Library Service (1887). Tireless in his efforts to promote coeducation Barnard fought unsuccessfully against trustee, faculty and student opposition to the inclusion of women students at Columbia College. Despite Barnard's strong opposition to a separate women’s college (in his opinion, men and women should be educated side by side), following his death, the newly affiliated women's college was named in his honor. Read more about F.A.P. Barnard in Columbians Ahead of Their Time.